"So-called Islamic State later claimed to be behind the attack, saying that Paddock had converted to Islam some months ago." Really? I find that hard to believe but you never know. 'No Way to Treat a Friend: Lifting the Lid on Complementary and Alternative Veterinary Medicine' book now available to order. ISIS just claimed responsibility for the mass shooting, saying the shooter converted to islam months ago (source on Twitter with Amaq messages: https://twitter.com/AmarAmarasingam/status/914854822708310016). ISIS just claimed responsibility for the mass shooting, saying the shooter converted to islam months ago (source on Twitter: https://twitter.com/AmarAmarasingam/status/914854822708310016). Well you wouldn't think bomb making Nazis would convert to Islam but we have proof that it can happen too. Stranger things have happened. But on the flip side, it's not like ISIS is above lying about this sort of thing. Time will tell. If I got a wood splinter, ISIS would claim responsibility. They are desperate, dying in the Syrian desert at many hands. Couple of days ago they released an audio tape allegedly of their dear leader Daeshbagdaddy who is dead by several accounts. Likely fraudulent. Here, no evidence at all presented. Yes, she thinks we are just that stupid. I'm imagining, but I can't for the life of me see the difference with a suppressor. If anything, a suppressor would make the rifle less powerful, right? Maybe Hillary watches too many movies. Can you really be serious with this post? I never knew that distinction. This doesn't mean anything. They like to claim responsibility. Trump was downright presidential just now! So who wrote it for him? Can be the case that they are lying, but judging from their past claims, this clearly isn't to be hand-waved. I was going to offer that as another option as a possible explanation for the shooting, but I figured it would just be a bad joke. I didn't picture 64 year olds suddenly converting to Islam and shooting up concerts. But.....who knows? We'll have to wait for an explanation, I suppose. Some quick calculations based on looking at google maps tells me the shooter was 800 to 2000 feet away from his victims. The dominant noise from a rifle using standard (supersonic) ammo at that range is the sonic boom which is not affected by a silencer. No. A modern silencer has metal baffles which do not touch the bullet as it passes through. It makes minor changes to point of impact but normally doesn't change accuracy. I think she is dishonest. She's smart, but acts like the people reading her tweets are stupid. Last edited by Ranb; 2nd October 2017 at 08:08 AM. Maybe she has decided that stupid tweets at inappropriate times have worked for Trump, so maybe if she starts doing it, it could work for her? No. I just could not imagine heaving up to ten guns plus a lot of ammo into a hotel. I would struggle to carry that lot. Now I know he had been in for four days, I see how he could get that lots in without raising any suspicion. The issue is no one from the hotel going into his room for 4 days. Wonder when he reserved the room? I don't even dislike Hillary but what a stupid and wrongheaded thing to say. Noise suppression is safety equipment. People believe in the movie version way too much. I'm in favor of sensible gun control, and noise suppression isn't on my radar at all. Tge shooter has been I.D.ed. Let's not grant this ************ any recognition as a human being and only refer to them as "the shooter." I have checked into the Mandalay Bay Hotel with my son's paintball gun, a skateboard and a scooter in a duffle. Why would anyone be suspicious? It is not uncommon for someone to be bringing in more stuff in future days. Do not disturb is not uncommon in any hotel plus why would a housekeeper have looked into his luggage. Last edited by eeyore1954; 2nd October 2017 at 08:19 AM. Put the "Do Not Disturb" thing on the door and you won't be disturbed. I've checked into a hotel with a longboard, microwave, kettle, toaster, two gaming system, and a full size exercise bicycle before ... no hassles. I agree. I think too many of these type of events are motivated by the desire for personal "fame" and "glory". If we take that away, it won't stop 'em all, but may prevent at least one. It's not the suppressor that reduces velocity, it would be the use of sub-sonic ammunition. You can use standard velocity ammo in a suppressed firearm, it just reduces the initial and subsequent sound suppression. Sorry given the vast variety of acts of inhumanity many human beings have committed, human being, in and of itself, is not exactly worthy of much veneration as a term. A single suitcase and one large gun case will bring in ten rifles and ammo depending on what he had. Not suspicious at all. I normally keep housekeeping out of my room when I'm staying for a while. I'll get my own sheets and towels at times from the staff at times. Last edited by Ranb; 2nd October 2017 at 08:24 AM. 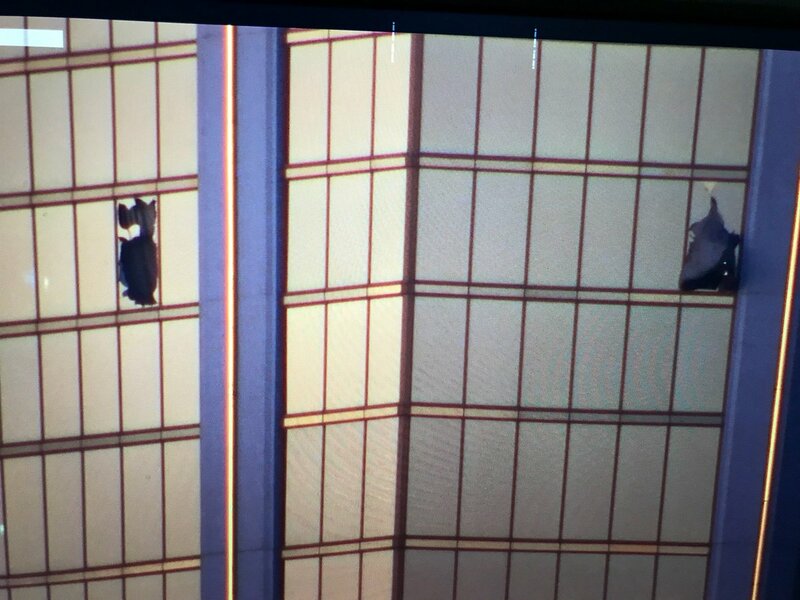 There are pics of two windows shot out, fairly far apart. Don't know if that's one big room, two different rooms, or what. Yeah, that struck me as off-key too. That could explain the "two shooting platforms" report? Recognize the good when you see it and encourage it. At this incident, people caught in the crowd helped other individuals get out of the area. Many were guests at the event, not police/fire/paramedics. Publicize their names (if they wish) not the name of the shooter. How easy would it be to enter a second room? ... I guess there's no reason he could not have booked two rooms ... not like he was planning on saving his money for anything.